I’ve been asked – having never hidden my views on Donald Trump or the issues as I see them facing the USA and the U.K. – whether or not there is any American who I admire. There has even been suggestions – well direct accusations really – that because of my opinions I’m anti-American which says more about others than about me – but that’s another story. Having given it some thought and taking into account the current state of play politically in the USA, UK and Europe there is one American who I think history has totally underestimated in terms of his contribution to the world. Towards the end of 1944 a meeting chaired jointly by Winston Churchill and Franklin D. Roosevelt took place. The meeting was the one to decide who would be the overall Commander in Chief of the Allied forces for D Day on 6th June 1944 and the person chosen was as we all – or at least should know – was one – General Dwight D. Eisenhower. Whilst the winning of the military conflict was clearly the main agenda item of the meeting the two leaders also discussed what would happen after victory had been achieved. Winning a war as history through the ages has proved is difficult enough but “winning the peace” has always been shown to be even more difficult as we are currently seeing only to clearly in the Middle East and especially Iraq. There was really only three candidates for the role of supreme commander, Field Marshall Bernard Montgomery, General Eisenhower and the man who is the subject of this – General George C. Marshall. Who you may well ask is George C. Marshall and you would not be alone. And why is he an American I most admire? Well General C. Marshall – or to give him his full name General George Catlett Marshall Jr – was the man chosen by President Roosevelt and then his successor President Harry S. Truman to oversee and organise the reconstruction of Europe after the war. What Roosevelt and Chrchill recognised above all else was that there could not and should not be a repeat of the gross mistakes that were made in imposing the terms of the Versailles Treaty at the end of WW1 which led directly to WW2. I won’t even try to imagine the disappointment that General Marshall must have felt when he was informed by his President that Eisenhower had been given the role of Allied Commander. However taking a step back and looking at the life he had led we can perhaps have an insight not only into his personality but also his dedication and patriotism to the USA and the cause of democratic freedom. 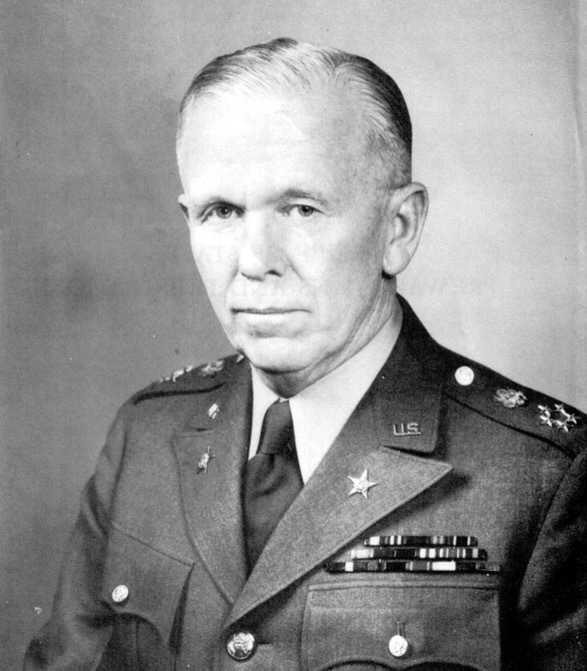 George Marshall entered this world on the 31st December 1880 and after graduating from the Virginia Military Institute served in the rarely remembered or talked about Philippine – American War and when the USA entered WW1 in 1916 he was one of the key planners of the USA campaigns. After World War One George Marshall served in various capacities which centred around planning, reorganising and modernising the US Army which was seen as a massive benefit when the USA entered the Second World War. This is of course all background to what was to come when on his appointment in 1939 as Chief of Staff he oversaw not only the largest military expansion of the USA but also was the coordinator of allied operations in Europe and the Pacific. Now for anyone -except an exceptional person – who had achieved so much at the age of 65 it would have been enough but in the true fashion of someone who believed in not only service but also humanity General George C. Marshall agreed to continue and between 1945 and 1949 he coordinated the economic and political reconstruction of post-war Europe. On retiring George C Marshall settled in what was a trademark quality he demonstrated throughout his life to a quiet life away from the limelight and refused to write his memoirs or to accept the many requests for him to cooperate with writing a biography. It is even reported that George C. Marshall was somewhat embarrassed that his name was applied to the fantastic reconstruction programme known as the Marshall Plan and to the compliments paid to him. Winston Churchill went as far as saying that General George C. Marshal was the man who was the “Organiser of Victory”. For such a great and yet modest man who believed the reward for doing his duty was in itself recognition enough I can only imagine what he felt when justifiably being awarded in 1953 the Nobel Peace Prize. So there you have it that in my opinion General George Catlett Marshal Jnr if not the certainly is one of the Americans I most admire. And even though he is apparently forgotten he is also one of the greatest Americans who ever lived and whose influence has directly shaped the world we live in today.